On behalf of Society for Threatened Peoples, Kalden Tsomo addressed the ongoing 40th session of the UN Human Rights Council. 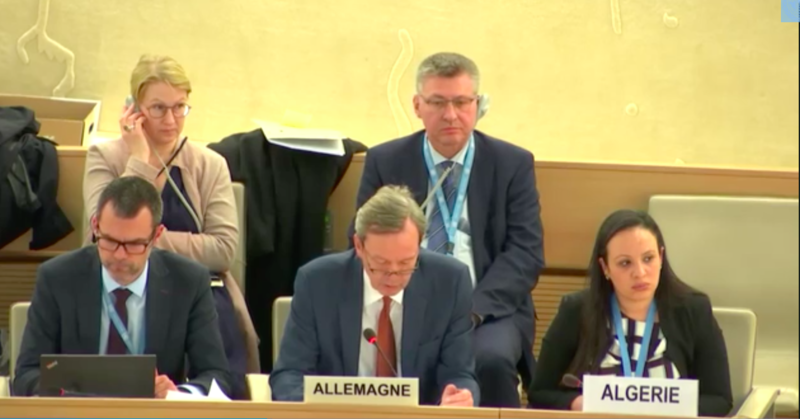 Geneva: At the ongoing 40th session of the UN Human Rights Council, several member states and International Human Rights organisation expressed concerns over unabated deteriorating human rights situation in Tibet, earlier this week. Highlighting human rights situation that requires council attention under item 4; Australia, Czech Republic, Germany, France, Switzerland and UK expressed serious concern over human rights violation in region under China. Germany is alarmed by the Chinese authorities “repression of human rights defenders, free press and minority.” Germany called upon China to “release and protect human rights defenders and allow meaningful access to independent observer. The delegate said the situation of “Uyghur and Tibetans who suffer systematic discrimination is particularly disturbing”. France remains “deeply concern over situation of human rights in Xinjiang and Tibet with reference to lawyers,” said the delegate. Marking the 60th anniversary of Tibetan National Uprising Day, on behalf of Society for Threatened Peoples, Kalden Tsomo said the “need for council’s attention on the situation in Tibet is more urgent than ever. Since 2009, more than 153 Tibetans have self-immolated in protest against the denial of basic human rights in Tibet”. Referring to the 30th years since the adoption of Convention on Rights of the Child, she further said “Tibetan children are ultimately paying the price. In addition to earlier reports of shutting down Tibetan private schools, in January this year, human rights watch has obtained a document that bans Tibetan children from attending Tibetan language classes conducted by Tibetan monasteries. Parents of Tibetan children are forced to take pledge that they will keep their children away from Buddhist religious activities during their holiday breaks”. And reminded the missing case of Gedhun Choekyi Nyima, the 11th Panchen Lama of Tibet. She urged the council to press China to uphold its commitment and respect the rights of Tibetan people, and actively call upon China to enter into dialogue with the envoy of His Holiness the Dalai Lama. During the session, several other international human rights organsiations including Helsinki Foundation, International Service for Human Rights and International Federation for human rights called upon Chinese authorities to respect the rights of Tibetan people. Mr. Michael Frelherr von UNGERN-Sternberg, Germany delegate addressing the council.